Yeah, Goonies and Gremlins were awesome Spielberg movies. 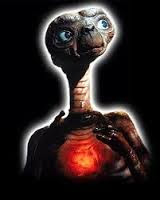 However, true followers of my blog know that E.T. is my favorite childhood movie of all time. Back in 1982, l remember my mom playing me this Neil Diamond song. "Oooh, Ally," she said. "This song is about your favorite movie, E.T. Listen!" The song was called "Heartlight." I loved it. I "taped" the tune and played it over and over again on my black and silver radio. Probably purchased at T.S.S. in Elmont, New York. The lyrics were simple, and for a 10-year-old kid, they were fairly easy to understand. Lines like, "...Cause sometimes the world ain't kind" and "...A friend is someone you need," and my personal favorite, "...And home's the most excellent place to be." I guess I just loved home and close friends. Simple kid stuff. Oddly enough, I’ve never thought much about "Heartlight" until today. Did a quick Wiki search. Neil Diamond wrote the song after viewing the film with his friends, songwriters Carole Bayer Sager and her husband at the time Burt Bacharach. Although the name E.T. is never once mentioned, the songwriters had to pay Universal Studios $25,000 for conceptual purposes. “Heartlight” was one of Neil Diamond’s last chart-topping hit.